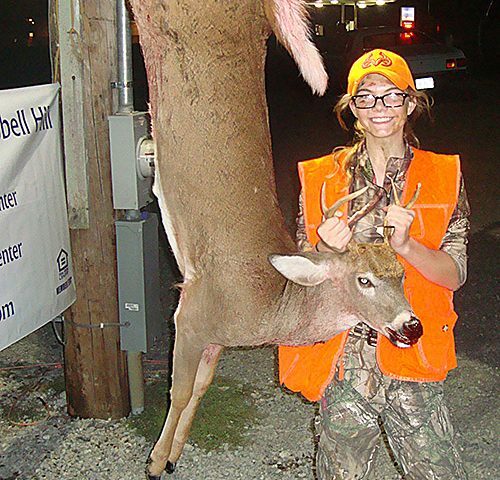 First State Bank of Campbell Hill, in partnership with Kevins Archery Center in Ava, held its Fifth Annual Youth Firearm Season Deer Contest October 6 – 8 , 2018 in conjunction with the Illinois Youth Firearm Deer Season. A grand total of 29 deer were checked in. Each participating youth received a blaze orange drawstring backpack compliments of First State Bank of Campbell Hill and were entered into a drawing for multiple prizes. Everyone had the same opportunity to win as the contest was not based upon the size of the deer, winners were drawn at random. The drawing for prizes was held at 9:00 PM on October 8 At Kevins Archery Center in Ava. First State Bank would like to congratulate all the youth hunters and thank all those who made generous prize donations and contributions to the contest: Kevin Bach Owner-Kevins Archery Center, Bob Sparling Taxidermist, J&J Guns & Knives, Carla Berry Hair Stylist, Jacob Deer Rut, Clay Fuhrhop-Tri-County Realty, Ryan Reiss—Southern Illinois Spine & Joint Center, Dental Center of Nashville, Midwest Land Reclamation, Froemling Building and Concrete, Brunzeez Café, Gabby’s Bar & Grill, Whitetails and Waterfowl Taxidermy, Knapp Oil, & Turquoise Door. Plans are already being made for the next year’s contest.